Shipping container architecture is a great way to build a sustainable home, but many architects and homeowners are also going a step further, and using these building blocks to build truly off-the-grid homes. The main advantages of such homes are the ability to place them virtually anywhere, minimizing the footprint and lowering the monthly costs to almost zero. Below are 5 examples of shipping container homes, which feature a variety of great technologies and methods to make them self-sustaining. 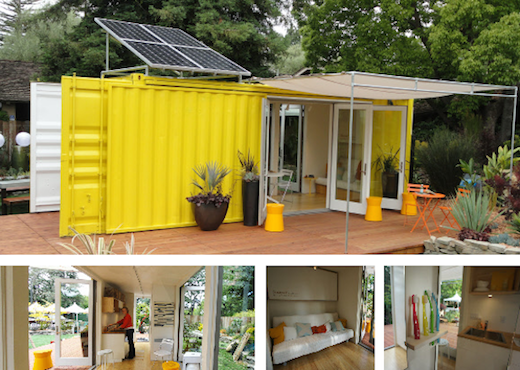 This shipping container home features 500 square feet of living space, which includes the deck space. To supply the necessary power to this home, it is fitted with 4 solar panels with 240 watts each, which are connected to a 3600watt 24volt TR3624 Xantrex Inverter and mounted using a Unirac mounting system. This system can produce up to 3,700 to 4,440 watt hours per day, calculated based on 5 to 6 hours of peak sunshine. The home also features a Water Saver toilet with a sink built into the tank, which makes direct recycling of grey water for flushing possible. This toilet can also be connected to a Bio-digester waste system. The home also features a gravity fed batch solar water heater. This is another great example of an off-grid shipping container home, and with this one, few would guess it is actually built from 2 repurposed containers. 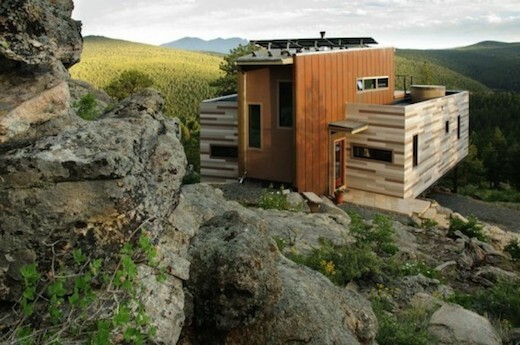 The home is located in Nederland, Colorado and was designed by Studio H:T. It can function completely off-the-grid thanks to a solar PV array, coupled with an optimized solar orientation, passive cooling, a green roof, pellet-stove heating, and more. The prefab home maker Cargotecture offers several great shipping container homes, one of which is the Lookout, which is small, sustainable, and yet incredibly cozy. Made from two shipping containers, it measures 640 square feet, and features a large living area with a kitchen, a spacious bedroom and bathroom, a media room and a lofted sleeping area for guests. 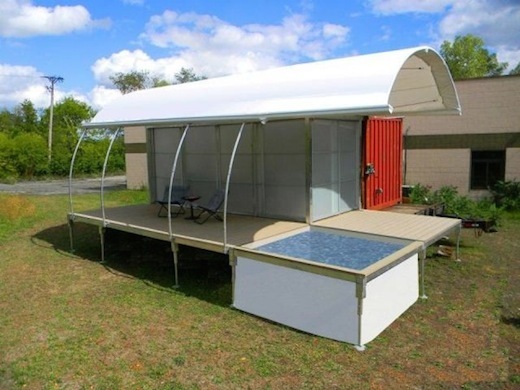 It can function completely off-the-grid, with a combination of rooftop mounted solar panels, natural gas or propane appliances, a composting toilet, and a roof water harvesting and reuse system. 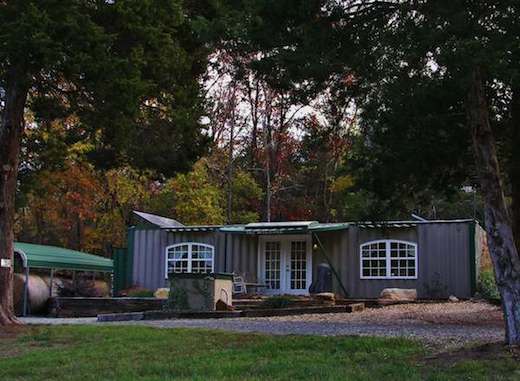 This is a great example of a DIY shipping container home that can function off-the-grid. TajMalodge is built out of two recycled shipping containers, which were welded together to form the 640-square-foot home. Also, there’s a home built solar panel to power the home, using discarded aluminum cans that were collected in roadside ditches. The finished panel is made of 240 aluminum cans and a 120 cfm 12 volt exhaust fan for drawing the cold air in and, expelling the hot air out. There’s also two additional 205 watt solar electric, which are needed for maintaining the batteries and a solar water heater panel. These sustainable shipping container cabins, built by the Canadian company Ecopods, all feature a 80-watt solar panel and a 12-volt battery, which takes care of its energy needs. The cabins also feature Sun-Mar composting toilets that can evaporate the water from the toilet waste and carry it back to the atmosphere via a specially designed vent system. The occupants’ water needs are taken care of by a WaterMill- an atmospheric water collection device that is capable of condensing water vapor, while purifying it as well. This system first draws in moist, outside air through an air filter, which then passes over a cooling element, and is condensed into water droplets. These are then collected and pushed through a specialized carbon filter that is exposed to an ultraviolet sterilizer that eliminates all bacteria to provide drinking water.